If you’re a “streak runner” like me, the best part of heading out the door for a run every day is that each run is a whole new experience. Having gone for a run of at least 3 miles every single day for the past 5 years, I was excited when Steve Good asked me to write about one of my “Good Runs”. I see agoodrun.com as not only an opportunity to add another adventure to my long log of daily runs but also as a way to share that experience with others. I’m currently attending Kettering University in Flint, Michigan. Formerly the General Motors Institute, Kettering is a STEM school, specializing in science, technology, engineering, and mathematics. It’s a very unique school in that every student is required to complete two years of co-op work experience in order to earn their degree. In order to allow students to accomplish this, the school is divided into sections, A-Section and B-Section. Given that I’m B-Section, I attend school from the beginning of October until the end of December and from the beginning of April until the end of June. During my three months of summer and winter, I work for my cooperative education employer, gaining real-world experience. The end result of my four years of year-round school and work is that I graduate with the equivalent of two years of engineering expertise. When I tell people that I live in Flint, Michigan for six months out of the year, they usually can’t imagine why anyone would want to live in a city with such a bad reputation. When I tell them that I venture out on the streets every day for my run, they begin to think that I’m borderline insane. The negative perception that people have of Flint and Detroit is part of what inspired me to write this blog post. Flint just isn’t given a fair shake by the media. My focus for this blog post was to try to break the stereotype of Flint being a run-down rustbelt city. While work still needs to be done, the city is making great strides to fill the void from the departure of the automotive industry. 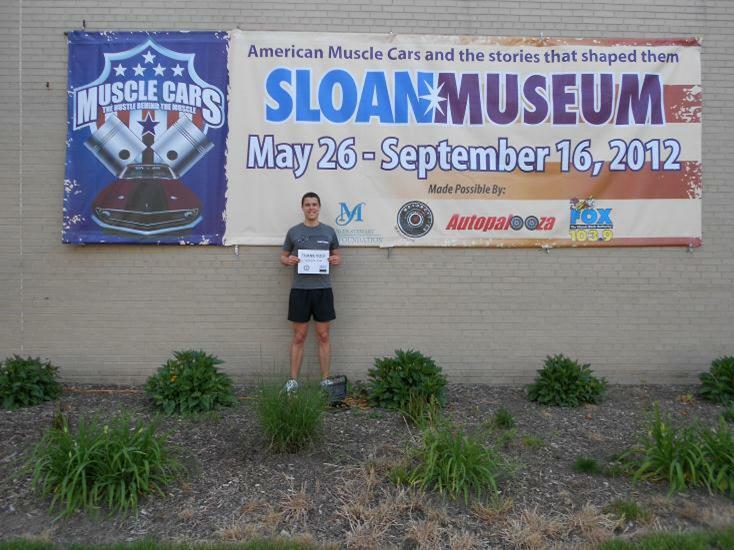 In mapping out my run, I chose to pay homage to the city’s automotive heritage while also highlighting how the city is moving into the 21st century. The other focus of this run is on my chosen philanthropic initiative, Iron Phi. Iron Phi supports both the ALS Association, which fights LouGehrig’s disease, and the Phi Delta Theta Foundation, which supports my fraternity’s educational efforts. I first learned about Iron Phi from Steve Good at the Phi Delta Theta Emerging Leaders Institute in 2010. I had never thought of using my running talents in order to help a cause, and Steve really encouraged me to give it a go. Last year, I was able to raise $1200 for the cause and become my chapter’s first Iron Phi. Really, it was Iron Phi that exposed me to the idea of giving back. 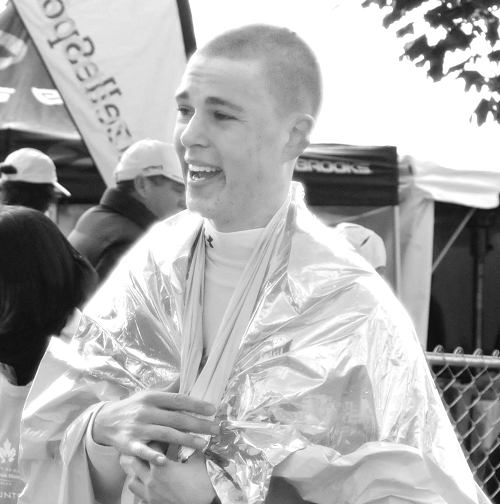 Before Iron Phi, I had never made a donation to a cause, nor had I raised money for one. I’d like to thank Steve not only for pushing me to “enjoy life by the help and society of others” by becoming an Iron Phi but also for establishing Iron Phi. It’s so encouraging to see someone I know start something that does so much good for others. My Grand-Little Brother in the Fraternity, Josh Klein, and I headed out the door of the Phi Delt ranch for our six-mile run on a clear May evening. We headed toward downtown Flint for our first stop, the Durant-Dort Carriage Company. This building is the birthplace of General Motors. William Durant led his automotive efforts from this location. It was here that much of the decision making for the development of Chevrolet and Buick took place. Not everyone knows it, but Flint was actually the richest United States city per capita in the 1970s. It’s thanks to Durant and the many General Motors plants in the area that the city was so successful. At this stop, I chose to thank Bart Buesseler. Bart was my Pledge Educator and the brother who really convinced me to join Phi Delta Theta. He and I still stay in close contact, and I regularly ask for his input on president-related decisions for our fraternity. Really, I can’t imagine my college experience without my brothers pushing me to hold myself to a higher standard and try new things. I owe it all to you, Bart. Thanks! From here, Josh and I jumped on the Flint River bike path, a beautiful new addition to the city. 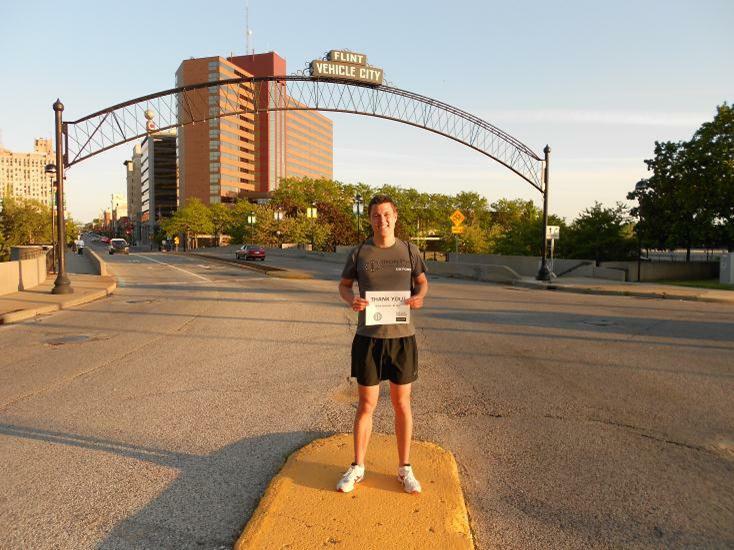 We took this to downtown Flint, where we stopped at our second spot on our run, the “Flint – Vehicle City” archway. Downtown Flint is lined with these arches with the one at the end of town displaying the “Vehicle City” name for Flint. Each arch is lined with lights on the underside of it. At twilight, it makes for an awesome sight that really adds to city atmosphere for Flint. In the background, you can see a portion of the cityscape. Downtown Flint is doing very well with a huge variety of local restaurants and businesses. The old Durant Hotel was recently converted into an enormous apartment building for the many students who attend the University of Michigan Flint campus. One thing that a lot of people don’t realize is that Flint is quite the college town. With four universities in the area, Flint is home to more than 30,000 college students. Here, I chose to thank Dave Farinelli. Dave is my Big Brother in the Fraternity and I owe a lot to him. He played a large part in recruiting me and has continued to serve as a mentor beyond pledging. It puts a smile on everyone’s face when Dave returns to the chapter house for get-togethers. 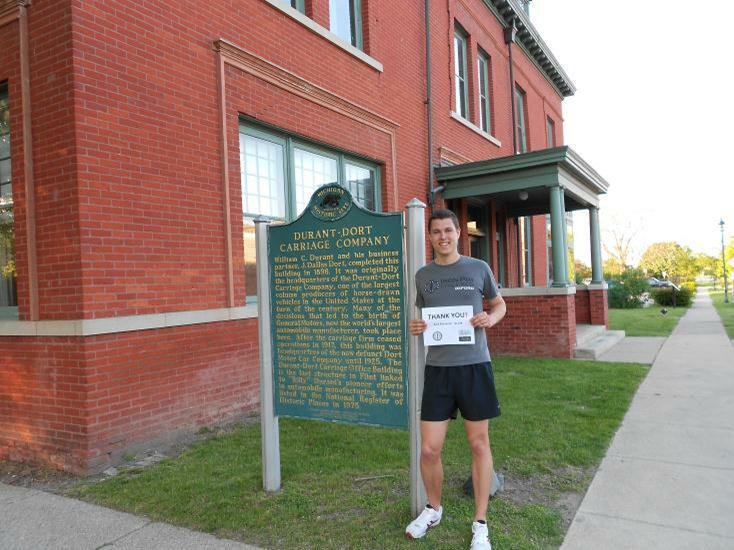 The next stop on my route was the Flint Cultural Center. Just outside town, the 30-acre campus is beautiful. The area does a great job of providing the city with some big-city amenities. From the Flint Institute of Arts, to the Longway Planetarium, to the Flint Institute of Music, to the Sloan Museum, it’s a beautiful area of the city that I’ve visited on numerous occasions. My primary destination in this area was the Buick Automotive Gallery. The Buick Automotive Gallery does a great job of paying respect to the city’s automotive heritage. If you want to learn about Flint’s automotive history, there’s no better place to go. If you’re into having props, there’s a 1910 Buick Touring in the museum that guests are allowed to climb inside. You’ll also find a “Hellcat” tank destroyer built in Flint by Buick during World War II, a testament to the city’s spirit and ingenuity. I thanked my first Little Brother in the Fraternity, Jordan Ruthe, at this stop. Jordan and I had all of the same classes during our first term at Kettering. I played a part in getting him to join Phi Delta Theta during my pledging term. The next term, I was given the honor of being his Big Brother. Jordan is a great guy and helped me to obtain my most recent co-op job in Washington DC. Although he’s transferred to George Mason, the chapter really misses him. Thanks, Jordan! 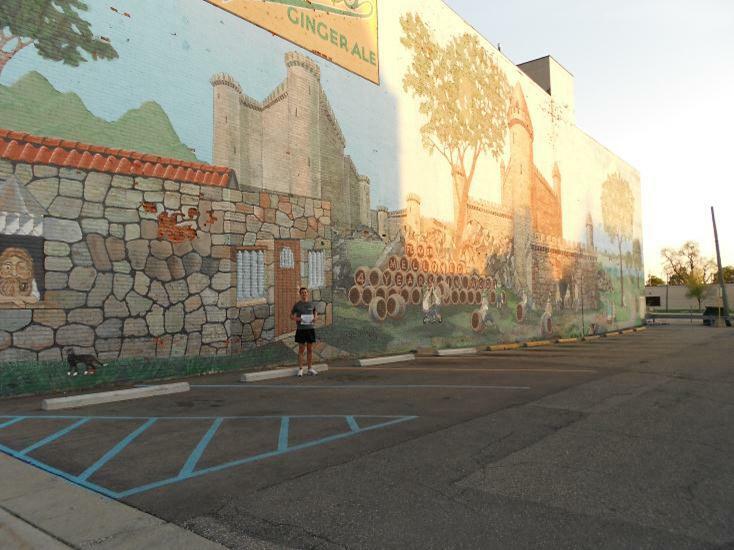 The Vernors mural in downtown Flint was the next stop on our run. This is an awesome mural depicting gnomes crafting America’s oldest surviving ginger ale. Vernors was first made in Detroit during the Civil War. Legend has it that James Vernor discovered the secret recipe when returning from four years of war and opening one of his barrels to discover a concoction with a flavor that he had never imagined. The drink is a Michigan staple and this mural does a great job of honoring it. This is one of a few different murals in the area that give the city some extra character. Here, I chose to thank Joe Jagadics. Joe is one of my best friends. He’s really caused me to think about what it means to be a Phi Delt. We’ve spent a considerable amount of time discussing The Bond of Phi Delta Theta, our Fraternity’s founding document, and just how we could really get all of the brothers in our chapter to really buy into the idea of holding ourselves to a higher standard. Thanks, Joe! Right next to the Vernors mural is Halo Burger, a Flint institution. 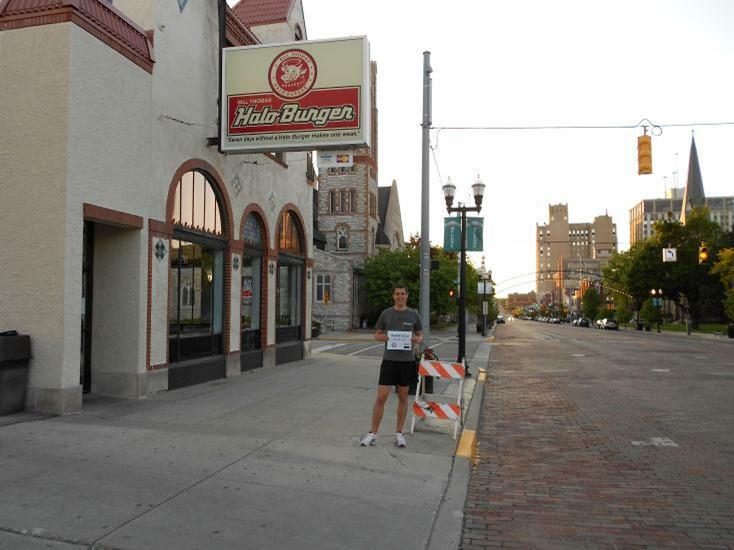 Over 80 years old, Halo Burger has a few different locations in the Flint area and is a local treasure. Widely regarded as the best burger in Michigan, Flint expatriates make this their first destination whenever they return to the area. For anyone who is always chasing the world’s best burger, I’d highly recommend checking out Halo Burger. In the background, you can get another view of downtown Flint. You can see the lights on the archways that I talked about earlier. The brick-paved main road through town gives the city an old-school feel that adds to the city’s character. It’s all these little things that make a trip through downtown Flint a pretty cool thing to experience. At this stop, I thanked David Shaffer, another one of my Little Brothers in my Phi Delt chapter. One of the most rewarding things about being a Big Brother in a fraternity is watching your Little Brothers step up and take on leadership positions in the chapter. Shaffer has went above and beyond the call of duty. During his first year of membership, he filled our vacant Treasurer position and overhauled the office. He’s a great friend, and the future of our Fraternity is brighter because we have him at the helm. Heading out of downtown Flint and toward Kettering, our next stop was “Chevy in the Hole”. Admittedly, this spot is a Flint eyesore. Formerly the home of one of General Motors’ most profitable plants, it’s now nothing more than a 130-acre concrete wasteland. Across the road from the area, you’ll find plaques commemorating the Flint sit-down strike. Taking place at the end of the year in 1936, the strike gave birth to the UAW. Instead of picketing, workers sat in the factory for over a month, preventing others from taking their jobs and bringing production to a standstill. 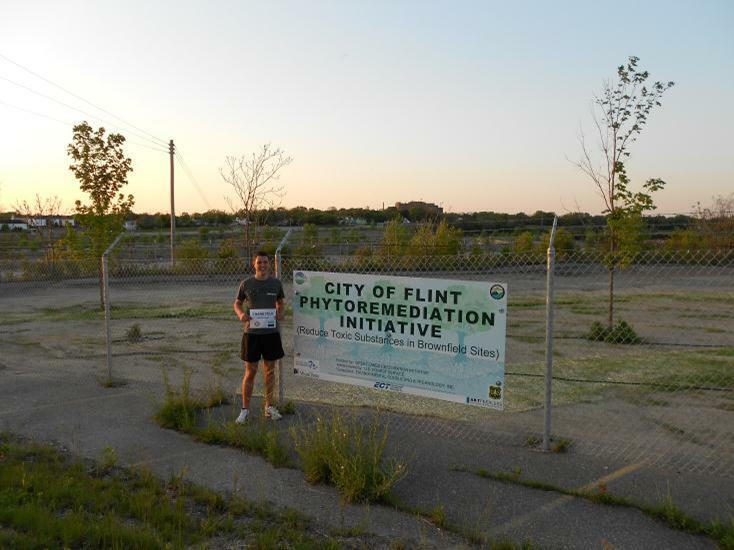 Currently, Flint is undertaking a “phytoremediation initiative”. The city is planting more than 1,000 trees in the area in order to reclaim it, beautify the city, and help the environment. The effort signals the city’s acceptance of the fact that the General Motors presence in the city will never be what it once was. It’s great to see the city take a proactive role in attempting to overhaul Flint and bring a new dimension to the city. I thanked Burl Keel at this stop. Burl is another one of my Little Brothers in the Fraternity. He currently serves as my Vice President and has been instrumental in upping the standards for the officers in our chapter. Not only that, but he has done tremendous work in revamping our bylaws and housing corporation constitution. Thanks, Burl! Just up the road from Chevy in the Hole is Kettering University, the General Motors Institute. Kettering churns out more mechanical engineers than any other school in the country year after year. The school has produced most of the leaders in the automotive industry and many more titans in other industries. Kettering is a great school that has provided me with more opportunities than I could’ve ever imagined. My co-op work experience has been invaluable in giving me a different view of the world and an appreciation for my engineering curriculum. This picture is of the entryway to the Academic Building, a historic building that is displayed on our school’s logo. I’ve greatly enjoyed my four years at Kettering, and it’s hard to believe that they’ll be coming to an end in just a few short weeks. My fourth and final Little Brother, Kyle David, is who I chose to thank here. It’s only fitting that I thank Kyle in front of our school. Kyle sets the standard for academic achievement in our chapter and is a big part of why our chapter has had the highest grades on campus for the last two terms. Like Shaffer, Kyle has really stepped up and taken a leadership role in the Fraternity and I couldn’t be more proud to be his Big B. 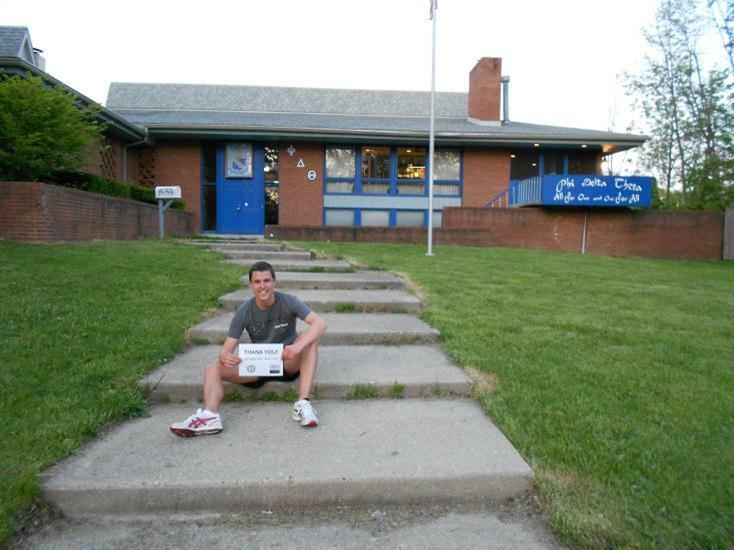 Just up the road from Kettering University is the Michigan Delta chapter of Phi Delta Theta where we end our run. Like I said earlier, I can’t imagine my college experience without Phi Delta Theta. This house has been my home for the last 4 years and parting ways with my brothers next month will be more difficult than I care to think about. While Kettering has taught me a lot, it can’t begin to compare to the life lessons that I’ve learned in the walls of the Michigan Delta chapter house. Here, I thank my pledge brothers: Mike Rettler, John Lawniczak, Mike Russell, Derek Bluth, and Jared Sanders. The chapter has come a long way from when we first joined. Building the membership from 13 to 42 brothers, winning the President’s Cup, raising money for ALS through the GM to GMI Run, pushing each other to become better than when we first joined – the list of memories and accomplishments during our time here goes on and on. We couldn’t have done it without each other, and I’m proud to call you my pledge brothers. Michael Boulter is a long-time runner. Having first started running in 2004, he’s been with the sport ever since. He enjoyed being a part of his high school cross country and track teams until his graduation in 2008. 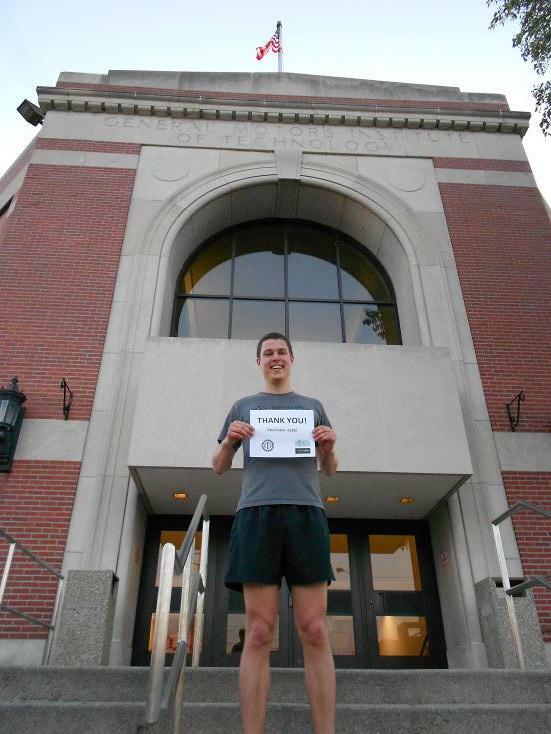 During college, he took up marathon running and has completed five marathons, placing in the Top-10 in both the Grand Rapids and Kalamazoo Marathons. He has qualified for the Boston Marathon in all five of his races, with a personal best marathon time of 2:43:50. His running streak will reach five years in June. At Kettering University, he is the President of the Michigan Delta chapter of Phi Delta Theta and former President of the Kettering Running Club. He will earn his Electrical Engineering degree this June and has spent his co-op terms working for companies ranging from automotive suppliers to the US government. After graduation, Michael will be working for Phi Delta Theta General Headquarters as an Expansion Consultant where he will help establish new Phi Delt chapters at schools across the country. Nice blog…thanks for the route and commentary! Kettering does not churn out “more mechanical engineers than any other school in the country year after year”. There are at least three schools in Michigan, let alone the entire country, that produce more. Hi there it’s me, I am also visiting this site daily, this site is really pleasant and the people are genuinely sharing nice thoughts. I enjoy, result in I discovered just what I wwas having a look for. You’ve ended my 4 day lengthy hunt! God Bless you man. Have a grat day.